Rystad Energy believes that offshore drillers will not fully recover until 2027. I analyze this scenario for leading drillers. Only Diamond Offshore can be considered relatively safe in the scenario of slow recovery. Fellow contributor Tudor Invest Holdings has recently alerted me to a Rystad Energy report calling for full recovery of offshore drillers in 2027. We are still in the first quarter of 2019, and, if such predictions are true, there’s an awful lot of time until this happy time. What does such a scenario mean for leading offshore drillers – Diamond Offshore (DO), Ensco (ESV), Rowan (RDC) (note that Ensco and Rowan will soon merge), Noble Corp. (NE), and Transocean (RIG). Here are my thoughts on this issue. First of all, I do not think that offshore drillers need full recovery to survive with the current capital structure. For example, a full recovery would imply drillship rates returning back above $500,000 from the current $175,000 (Bassoe offshore estimate) – that’s excessive if we are discussing survival chances. In my opinion, an increase of 60-70% from current levels will be sufficient enough to let drillers refinance the first maturities and wait for the full recovery. In case of slow recovery, drillers’ balance sheet strength and maturity schedule become the most important factors that determine whether a company can survive with the current capital structure or it needs to restructure in order to become competitive. The table below shows maturity schedules in the key years 2023–2026, which represent a “debt wall” for the industry. The clear leader in the slow recovery scenario is Diamond Offshore. The company has the least debt in the 2023–2026 timeframe. In addition, this debt is very comfortably located as the majority of it comes in 2025. As the company has been very conservative during the downturn, and there’s no reason to expect that it will suddenly move to an aggressive strategy, Diamond Offshore is the primary survival candidate which will live to enjoy full recovery whenever it happens. Currently, Diamond Offshore is trading in the wide $9.00-12.00 range, being a value play at the bottom of the range and a momentum play on the breach of the $12.00 resistance level. Ensco/Rowan will have to deal with a significant maturity problem following the merger. The combined company will need to see a material improvement in the market before 2024, so that it is able to refinance the debt. The good news for Ensco is that acquisition of Rowan adds $1 billion of cash, giving the combined company an immediate liquidity boost. Ensco shares have recently been trading in a rather calm fashion. Perhaps, the market wants to hear about the plans of the combined company during the first quarter earnings season before making any material moves. Noble Corp. also needs a timely recovery. The stock has completely ignored the recent upside in oil prices, which is somewhat strange, given the fact that the company does not have near-term liquidity worries. Transocean, which has put material pressure on its balance sheet with the acquisition of Ocean Rig, will be the company in most need of the timely recovery. With a major maturity in 2023 (and $1.3 billion maturities in 2020-2022), the company is more pressed for time than its peers. I’m sure that loyal readers will be quick to remind me that I was skeptical that Transocean shares can breach the $9.00 level without Brent oil (BNO) going to $70. While this time, the very short-term crystal ball clearly flopped, I maintain my fundamental assessment of Transocean’s acquisition of Ocean Rig – it’s a very dubious decision that has put the company under the risk that has not been present before. 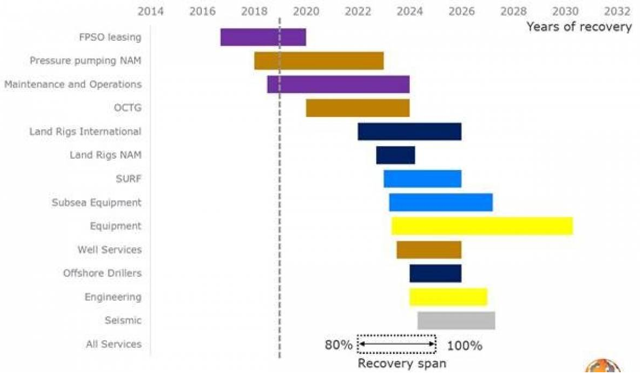 The slow recovery scenario is a real risk for the industry. The only safe bet in this case is Diamond Offshore. Other companies depend on the exact timing of dayrate improvement.